Photo provided by Hubert Scharnagl. 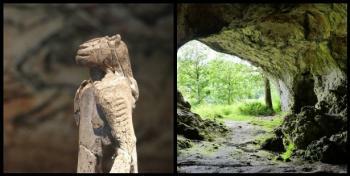 The Caves and Ice Age Art in the Swabian Jura comprise archaeological sites from the Aurignacian period where stone tools, figurative art and early musical instruments have been found. It covers 2 locations with 3 caves each: the Ach Valley and the Lone River. The objects were carved from various materials, including mammoth ivory. Notable finding include the figurines of the ‘Venus of Hohle Fels’ and the ‘Lion Man’. The Caves and Ice Age Art in the Swabian Jura was a welcome addition to the WH List this year for those ticking off Western European WHS on weekend trips. Recent reviews of it by Hubert and Clyde have already paved the way regarding all practical details necessary for a worthwhile trip. The site lies some 620km from my home, and I visited it by car with a stop-over in Darmstadt. I decided to not visit all locations, but instead do some cherry picking among the inscribed caves and associated museums with a special focus on seeing the figurines. My day of exploration started at the Archäopark Vogelherd. At the park entrance there is a small exhibition room, and that’s where I found my two first figurines: a mammoth and a cave lion. Both are tiny objects. They are on show in a display case each, and there’s nothing else in the room. The mammoth is easy to recognize as such and is in perfect shape. It has to be admired from the “front” though, as the other side is much more rough. This seems to suggest that it was a brooch or similar ornament worn on clothing or the body. The other figure is said to represent a cave lion. With some imagination a tiger or a puma as we now know them can be seen in the object. “Cave lions” were widespread in the age of the early homo sapiens and could grow bigger than modern lions. They probably had no manes, hence the similarity with other big cats rather than male lions. They did not really live in caves (phew!) but did sometimes enter them to surprise a hibernating bear. In this Lone River Valley area I also visited the Vogelherd and Hohlenstein Stadel caves. Both are fairly large, enough to provide a shelter to families during the harsh winter time. In the early afternoon I arrived near the other cluster of sites, in the Ach Valley. I started at the Urgeschichtliches Museum in Blaubeuren. This undoubtedly is THE museum to go and see when you want to learn more about the Ice Age Art of this region. It displays various attributes such as the raw materials (mammoth bones) and the tools that were used. Most objects that are shown were found at the nearby Hohle Fels Cave. In this museum I saw my first examples of the “earliest musical instruments”, one of the claims to fame of this WHS. The flowery description in the nomination file might suggest early pianos or harps, but these “instruments” are all flutes. The museum also has a number of figurines. There is a diving bird (looks like a duck), a tiny lion man and the prize piece of the collection: the Venus of Hohle Fels, "the oldest undisputed example of a depiction of a human being yet discovered". This one even has a whole exhibition room to itself! The female figurine was only discovered as recent as 2008. I ended my day at the Hohle Fels cave. This was a pleasant surprise as well. It really is a huge cave. A music group was performing inside, using “ancient” instruments. I always thought that when I really had money I would start collecting Netsuke – Japanese miniature sculptures. These small Ice Age figurines, mostly made out of mammoth bone, reminded me of them. There are so few left (about 50). But even in this day and age they can be admired as art objects. I recently went to Ulm to have a look at the newly inscribed Ice Age sites, and I picked the Vogelherd and Hohle Fels caves as the ones easiest to reach by public transport. Both can be done in a day (I went on a Sunday in summer), but because there are only 3 daily buses to Vogelherd (from the train station in Niederstotzingen), I could not visit the museum in Blaubeuren, as I had originally planned. The Vogelherd cave is part of the Archaeopark, a nice little museum/visitor centre/archaeological event centre. A relatively short walking path takes you to the actual cave, which is really quite small and open to the elements - hard to imagine how people back then would have survived a strong winter. In the afternoon, I took the train (via Ulm) to Schelklingen, from where it is about a 25-minute walk to the entrance of the Hohle Fels cave. There is a small exhibition at the entrance, and the actual cave is really quite big and impressive - to me, a real cave compared to Vogelherd, which just seemed to be an opening in the rock. You can walk all the way to the far upper end, it's just a bit slippery inside. Because I had no time for the museum on this or the following day (it is closed on Mondays), I thought that I had learned more about caves than about the actual cave art, but it was still an enjoyable day. Ulm is by the way a very pretty town that is worth a stay, especially for the Minster, which has the highest spire in the world and is the largest Protestant church in Germany. I visited this WHS in August 2017. I visited on a long Sunday road trip from Luxembourg so as to be able to visit the Hohle Fels cave. Hubert's review was the main source of useful concentrated info on the 6 caves that make up this WHS as well as on the nearby museums where most of the finds can be seen. In my review I'll try to give further information and tips for any future visitors. In the forum, he also gave me a very good link with a useful map. At the point where the Swabian Alb (plateau) inclines towards the Alpine foreland, it is believed that an enormous leap occurred in the cultural development of humanity - the first figurine representations of animals and humans are believed to have been created here as well as the first musical instruments. This is why these 6 caves have been inscribed as a WHS as the oldest Ice Age art (Aurignacian-Gravettian-Magdalenian periods) was found here. In a way, through this newly inscribed series, Germany tries to make up for the lack of prehistoric rock art and paintings when compared to other European countries. The original Ice Age art can be viewed in 5 museums: one in Stuttgart, another in Tubingen and three quite close to the caves themselves - the Archaeopark Vogelherd in Niederstotzingen (open 10:00-18:00; 7 euro which also gives you access to the Vogelherd Cave); houses a small mammoth and a lion figurine from Vogelherd, the Ulmer Museum in Ulm (open 11:00-17:00; 8 euro; 'strictly' no photos allowed; houses the Lion Man from the Hohlenstein Stadel Cave, and the Museum of Prehistory in Blaubeuren (open 10:00-17:00; 5 euro + 1 euro for photography; houses several remains from the Lone valley caves). Since all the museums open rather late at 10am, I started with the Hohlenstein Stadel Cave in the Lone Valley. To get there by car, I put Lindenauerweg, Rammingen (89192) in my navigator and followed the signs to the tiny hamlet of Lindenau, where there is a small free parking lot with information boards and an unmanned information point with an interesting video on the Ice Age Caves of the Lone Valley and the Lion Man (opposite restaurant Lindenau). Most of the hamlets have banners proudly displaying the recent inscription on the WH list but there are no plaques yet. From the parking lot head out of the hamlet for a rather flat 1km walk and keep to the left following the signs 'Zum Baerenhohle'. The Hohlestein Cave is actually made up of 3 caves: the Baerenhohle (earliest excavation of bones of a 10,000 year old bear), the Stadel Cave (where the Lion Man was found) and the Kleine Scheuer located between the two. All caves are now open and freely accessible except the innermost part of the Stadel cave (where more fragments of the Lion Man were found recently). Instead of walking back to the car, since it was still early to visit the Vogelherd cave, I decided to follow the flat 2km walking trail to the Bockstein cave. The final part can be tricky as the cave is completely hidden behind the trees. Just keep on walking on the grass and eventually you'll see a small 'Bockenstein' sign (the last bit is a steep uphill walk). Here mesolithic burials and Neanderthal tools and bone jewellery were found. The cave is freely accessible but its ceiling is heavily eroded so nothing pretty much to see. If you want to skip one of the caves in the Lone Valley this is the least interesting. The trail back to Lindenau from here is marked as Neandertal weg and is quite muddy. At around 10am I drove to the Archaeopark Vogelherd, paid for 2hrs parking and went straight to the Vogelherd Cave with two entrances, before the first visitors and families. Stone tools were discovered in the throw-off of a badger's burrow and 9 small figures carved out of mammoth ivory are the most important discoveries and are part of the oldest figural art of humanity. The sediments from this cave were excavated recently and almost 400 ornaments and figure fragments from bird bones and mammoth ivory were found. The small mammoth in the visitor centre is worth viewing even though the 8 euro entrance fee is value for money mostly for families with children as there are several activities organised for them. Next I went to the Ulmer Museum (some 30km away) to see the Lion Man gallery. I parked at the cheap and safe underground Parkhaus Kornhaus in Rosengassen. The Lion Man was recently restored in 2013 and it's a giant puzzle consisting of roughly 300 pieces of mammoth ivory. It is the largest and most mysterious piece of art from the beginning of the Upper Paleolithic from around 40,000 years ago. I still managed to take a photo of it with the Chauvet Cave Rock Art in the background. Nobody informs you that photography is not allowed until you get to the Lion Man gallery which is quite unfair. The Museum in Blaubeuren's approach to photography makes much more sense and the price is also cheaper so if you're pressed for time and money, the museum in Blaubeuren is your best bet. In the Museum of Prehistory in Blaubeuren (2 hours free parking), you have to leave your bags in free lockers, and there is a very well presented and informative loop to see the finds from the Ach valley caves (highlights are the 3 flutes, the adorant, the painted stones, the water bird and the tiny Venus of Hohle Fels). The staff here is very friendly and there's also an information desk to help you if you still have trouble locating any of the caves. In the afternoon, I drove straight to the Hohle Fels cave (usually open on Sundays 14:00-17:00 but in August open Thursday-Sunday 14:00-17:00 and Wednesday 10:00-17:00; 3 euro). This is the largest of the inscribed caves and the University of Tubingen still carries out excavations here in the Summer. The sediments from different periods have been collected in different white sacks, marked and are still being analysed. Some 80,000 stone tools and 300 ornaments were found here so far. On the other side of the valley (and of the 492 road), further on is a small wooden hut and space for maybe six cars. From here, a short but steep uphill climb will lead you to the Sirgenstein cave. This cave is freely accessible but be careful while getting there as there are no railings. This is the least marked cave and the most popular for abseiling. I was surprised that a group of locals was climbing up the rockface just next to the cave's entrance. Many of the abseilers are apparently birdwatchers. A nearby information board points out that several birds of prey and owls nest here. Last but not least, I drove back a few metres towards Bruckfelsstrasse, through a level crossing, where an information board and commemorative plaque marks the uphill trail towards the Geissenklosterle cave. Be on the lookout for a large rockface among the tall trees and a small cave entrance closed with an iron gate. Excavations are still underway here with equipment and archaeological markings still visible. Apparently, the museum in Blaubeuren is organising an information visit on Sunday 10th September 2017 to this cave (open 10:00-18:00) to see the archaeologists at work. There isn't much to see here anyway and if you were pressed for time, I'd recommend skipping this one from the Ach valley inscribed caves. All in all, I enjoyed my long day of cave-hunting and I'm very happy that Germany is complete once again. The paleontologists in Germany suffer a bit from the fact, that there are no sites of prehistoric rock art, not even simple scratches of arrows or circles, not to mention such beautiful cave paintings like in Chauvet and Altamira. But it is a kind of compensation that some of the earliest examples of figurative artworks were found in caves of the Swabian Alb. The objects are attributed to the Aurignacian and are about 40,000 years old. The figurines are made of mammoth ivory and are only a few centimetres tall, not larger than a matchbook. In total, about fifty figurines were found, mostly only fragments, less than half of them have been preserved in a way that they can be clearly identified. Most figures represent animals that lived during the last Ice Age in the Swabian Alb, like mammoth, wild horse or lion, but also bird and fish. Other remarkable items are small flutes made of ivory and bird bones, these are the oldest known musical instruments, also about 42,000 years old. 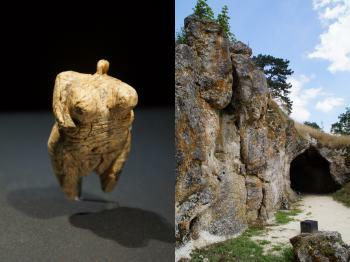 Two finds stand out: the Venus of Hohle Fels (excavated in 2008, photo left), which is considered the oldest sculpture of a human body, and the Lion Man, a hybrid creature of a human body with the head and limbs of a lion, with 31 centimetres it is by far the largest of the found objects. Amazingly, it was reassembled of more than 300 fragments. The figurines are truly amazing and it's impressive how old they are. However, the excavated finds are movable and are shown in museums, they cannot be part of the nomination. The caves themselves are not outstanding, most of them are rather small or just a rock shelter. In fact, there is not much to see. But this issue is similar to some fossil hominid sites, where it is also more important what was found there, than what can be seen there. So why not also inscribing the caves of Ice Age art? The proposed site consists of six caves, three in the Ach Valley and three in the Lone Valley, the distance between the two clusters is about 40 kilometres. The valleys are in low mountain range, about 500 metres above sea level. 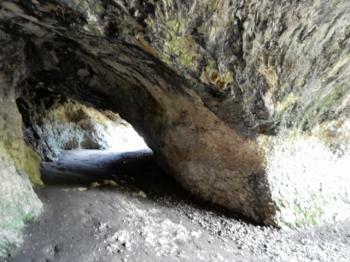 The caves are easily accessible, all close to a main road. To grasp the importance of the caves, it is useful to see also some of the figurines. Unfortunately, there is no central museum or visitor centre showing all of the excavated objects, they are spread over five different locations. 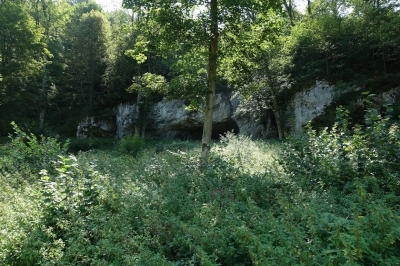 Vogelherd cave: a small U-shaped cave with two entrances and a length of 40 metres, most of the animal figures were found there. The cave is only accessible via the Archaeopark Vogelherd (8 Euro entrance fee, www.archaeopark-vogelherd.de), the visitor centre shows two finds, a mammoth and a cave lion. The visitor centre nicely fits in the landscape, the Archaeopark presents several aspects of the life in the Ice Age, but these attractions are more interesting for children. 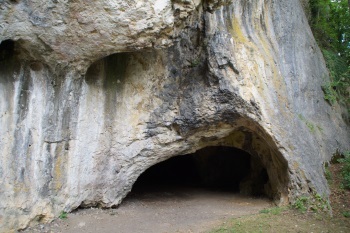 Hohlenstein-Stadel cave: a 50 metre long, narrow cave; place where the Lion Man was found; the entrance is closed with a lattice gate to protect the bats; one kilometre walk from the hamlet Lindenau. Bockstein cave: a small cave, only about 20 metres, freely accessible; the oldest proven settlement in the area, no art objects were found, but tools, ornaments and other artefacts, the oldest finds are about 70,000 years; the car park is between the towns of Bissingen and Öllingen, a short walk to the edge of the wood, then a steep climb, the cave is about 20 metres above the bottom of the valley. Urgeschichtliches Museum in Blaubeuren: the best choice to see some of the found objects, the main part of the museum is dedicated to the Paleolithic period, originals of the Venus of the Hohe Fels, a horse's head, a water bird, and three flutes are shown. The Ulm City Museum shows only one of the figurines, but it's the most fascinating: the Lion Man (www.loewenmensch.de). Other excavated finds are in the Museum of the Tübingen University (where most of the animal figures are shown) and the Landesmuseum Württemberg in Stuttgart (a few figurines, ornaments and artefacts, mainly from the Geißenklösterle). The Caves of Ice Age art are scheduled the first nomination of the new T-list sites and I think with good chances for inscription, their significance is undeniable. However, we have to wait how ICOMOS and the WHC deal with the issue that a major feature of the site are the movable items. The applicants seem to be aware of this problem, as they emphasize in the justification of outstanding universal value that caves, finds and surrounding landscape represent a cultural ensemble. The Caves and Ice Age Art are yet another prehistoric site with all the caveats that go along with it. There isn’t all that much to see. The findings were moved off site and are shown in several museums. As upside, I really enjoyed hiking along the Lone valley on a sunny summer day. And as the caves aren't that touristy you are free to explore them. Blaubeuren and Schelklingen are on the same train line from Ulm. The caves are found between Schelklingen and Blaubeuren. Seeing the Urgeschichtliches Museum is in Blaubeuren, it seems best to start at the far end in Schelklingen and end up at the museum at the end. Getting to the Lone area is a bit trickier. The Archäopark Vogelherd has a shuttle bus to the train station in Niederstotzigen. Bihourly there is a direct bus (#59) from Ulm stopping in Öllingen (get off at Hirsch) for the Bocksteinhöhle and Stetten ob Lontal (get off at Kirche) for the Archäopark. My recommendation would be to start in Öllingen. From the bus stop it's a 30min walk to get to the Lone river. Be advised that the signposting in the area leaves much to be desired and that especially the area around the Bocksteinhöhle is a bit challenging. Google Maps is wrong for the area. The location of the Bocksteinhöhle is wrong. And the buses are missing from the public transport connections. Our data meanwhile is correct. The best public transport information is available from Deutsche Bahn. This holds true for all of Germany (and some other countries, too). Ulm is a pleasant city in the mold of Strasbourg. The most famous site is the Münster, the largest church tower and for a short period the largest building in the world. The city also offers great views of the Danube. If you are into Pile Dwellings, there seems to be one pretty close to Ulm. One of Germany's top attractions, Neuschwanenstein, can be reached from Ulm via train to Füssen. From there buses will take you to the pseudo castle. Just follow the crowds. Some of the buses will continue to the pilgrimage church in Wies. Stuttgart is an hour by train and there you can see one of Le Corbusier’s lesser works. Aalen to the North is on the Limes and the museum seems rather interesting. Via Friedrichshafen you can travel to St Gallen as a day trip. Finally, the Augsburg water works are on the tentative list. "Cave Man" sites: "Modern humans first arrived in Europe 43,000 years ago during the last ice age. One of the areas where they took up residence was the Swabian Jura in southern Germany. Excavated from the 1860s, six caves have revealed items dating from 43,000 to 33,000 years ago. Among them are carved figurines of animals (including cave lions, mammoths, horses and cattle), musical instruments and items of personal adornment. Other figurines depict creatures that are half animal, half human and there is one statuette of a female form. These archaeological sites feature some of the oldest figurative art worldwide and help shed light on the origins of human artistic development."